Auction ends: January 8, 2017 9:33 AM PST. Comments: A Bruges Bloemwerk collar with bold, well executed design. Everything seems nicely in balance in this piece. Note the little ‘islands’ where the picoted brides meet and single woven tally fillings. Good example of the type. Damage: Slight fraying at some bride ends. Soilage: :Seller cites mid ivory color. Sold for £16.80, 5 bidders. Auction ends: January 8, 2017 9:54 AM PST. January 9, 2017 10:58 AM PST. Comments: Valenciennes insertions are useful, but a little rare. In #1 these are fairly simple, a single line of leaves in the two two, and an interesting line of ovals in the bottom one. In #2 the top three insertions have a more undulating pattern. The bottom tow are simple slightly scalloped borders. Modifications: All cut one end, can’t see the other ends. Note the tags on two piece in #1, might be original. Damage: Nothing obvious from the single photo. Soilage: :Seller cites mid ivory color. Middle one in #1 has a few brown spots. Sold for £14.54, 3 bidders. Sold for £30.00, 1 bidder. Auction ends: January 8, 2017 9:58 AM PST. Comments: Simple, scalloped Valenciennes border with one row of circular esprits. The design seems to be a stylized leaf arrangement. Square mesh. Damage: Occasional weakness both the top and bottom border, minor. Soilage: :Seller cites pale ivory color. Auction ends: January 8, 2017 10:11 AM PST. Comments: An elaborate Chantilly hat veil. Note the top line of holes for threading the gathering ribbon. Elaborate romantic floral design, almost too detailed for a hat veil. No ombré shading, but various filling stitches and gimp work do gives some dimension to the halfstitch. An impressive design which has seen better days as far as condition goes. Damage: Racroc splits, other holes and general wear. Size: Not given. Might be about 6″ high to scale with the hand in one photo. Auction ends: January 8, 2017 6:47 PM PST. 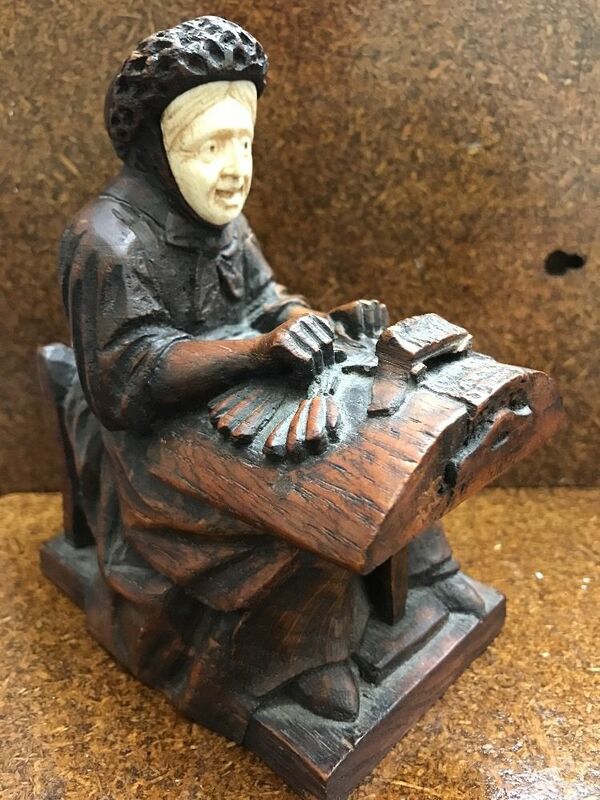 Comments: A wooden carving of a Belgian lacemaker, no maker given. Well detailed, with some staining and burning? coloration. We usually think of such pieces as German, but this is obviously a Belgian subject. Damage: crack across the right shoulder. Soilage: Hard to tell. Face looks clean. 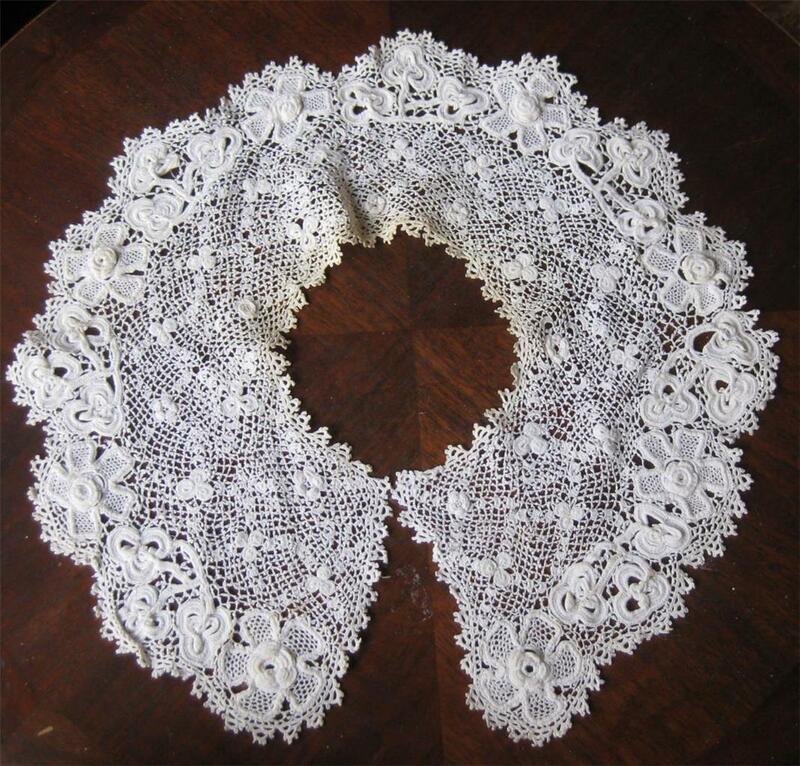 Size: 26″ diameter, lace is 5″ deep. Auction ends: January 8, 2017 8:48 PM PST. Comments: A table cover of Point de Paris with floral design including birds and dogs. That might be a butterfly above the dog. Fairly complex, careful work. Note the eyelet embroidery in the center cloth. Damage: Nothing obvious for the photos. Finish: Light wrinkling and some fold creases. 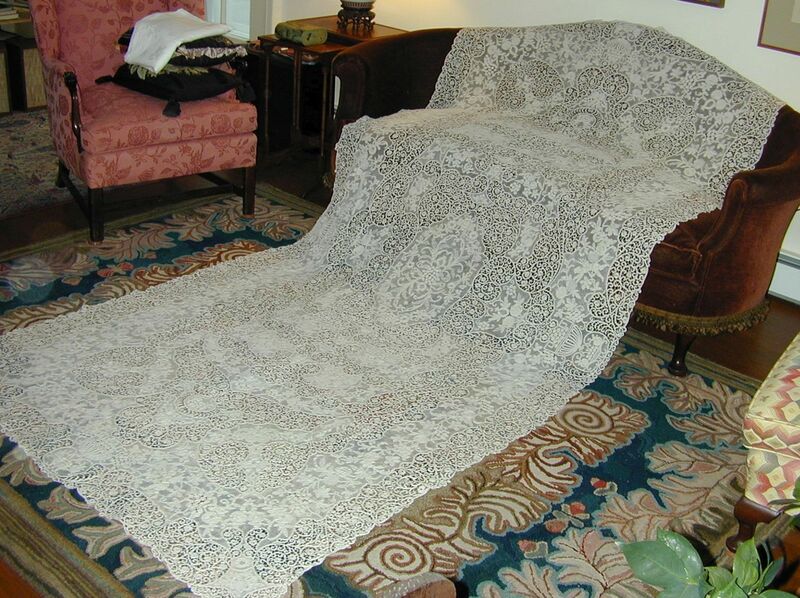 Size: 37″ long, 13″ center depth, 5.5″ max width lappets. Auction ends: January 9, 2017 9:41 AM PST. Comments: A Chantilly fallcap. The thread looks thick and black, probably a Belgian product. Interesting design with three points on one side of the headpiece and one on the other side. You see this in Honiton sometimes. The lappet ends are quit thick. Floral design with honeycomb fillings. Damage: A few loose threads, minor. Occasional knot in the mesh, might be from changing threads? Auction ends: January 10, 2017 10:00 AM PST. 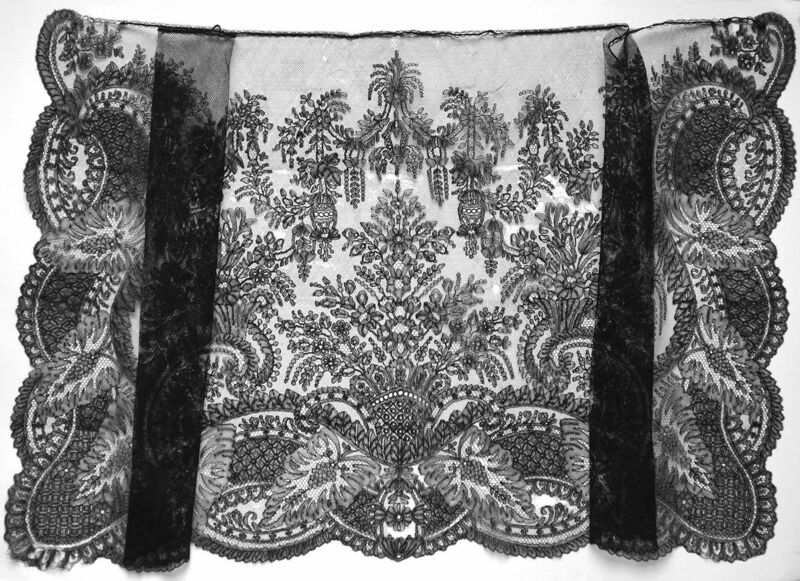 Comments: A probable Belgian needlelace applique on machine net. Given the rather large width and the rolled top edge, this might be cut down from a larger piece. Still, needlelace applique in a form like this is unusual. Light florals along the lower border and up the sides, single sprigs used as esprits. Modifications: May be cut down from a larger piece. Damage: Three pinholes in the tulle, 2 small breaks along bottom edge. A few pulls in the tulle. Finish: A little minor wrinkling. Nice drape to the net. Sold for $78.77, 5 bidders. Auction ends: January 10, 2017 12:14 PM PST. 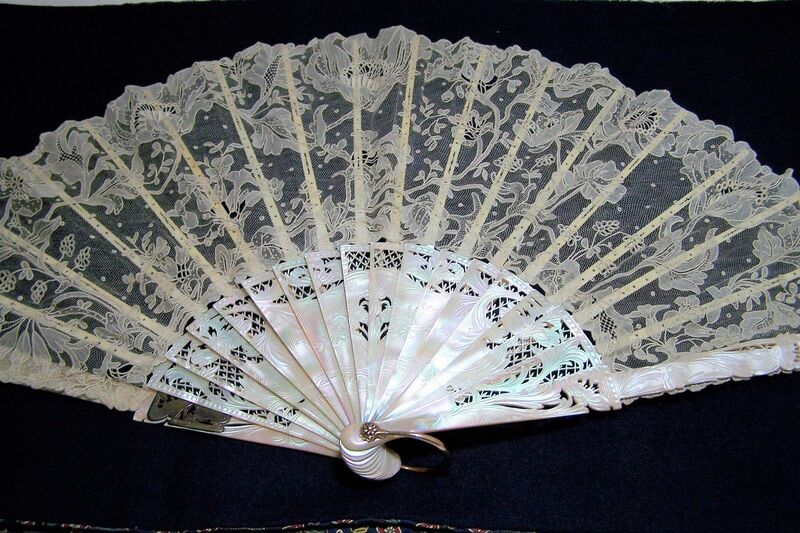 Comments: A Point de Gaze fan with carved Mother of Pearl (Abalone) sticks. It has the nicest repair to a guardstick I’ve ever seen. Excellent Art Nouveau floral design, no raised work. This is a higher end market piece, even without much in the way of decorative fillings. Comes with box. Damage: One repaired stick. 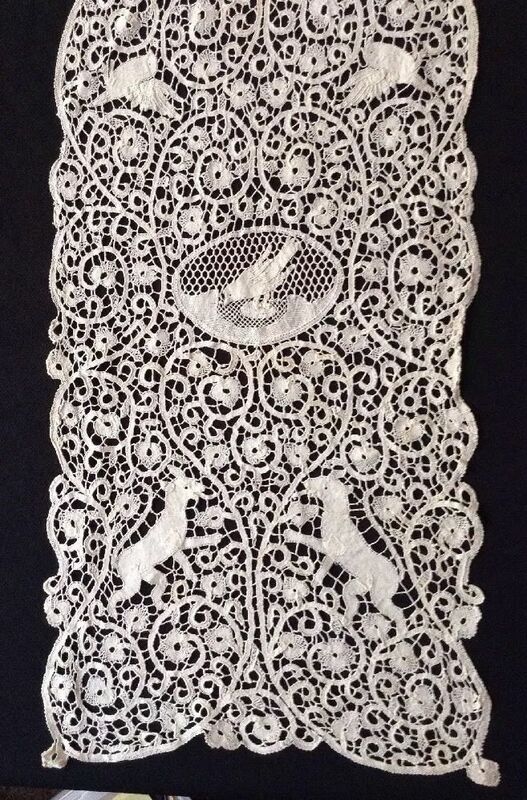 Lace looks OK.
Sold for $338.00, 3 bidders. Auction ends: January 10, 2017 8:32 PM PST. Comments: A Beds insert with typical pattern of a single central piece with separate plaited edge added at the neckline and outer border. Note the raised tallies on the leaves in the central part. Good design, typical of Armstrong manufacture. Auction ends: January 11, 2017 5:39 AM PST. Comments: A runner of Brussels Duchesse. 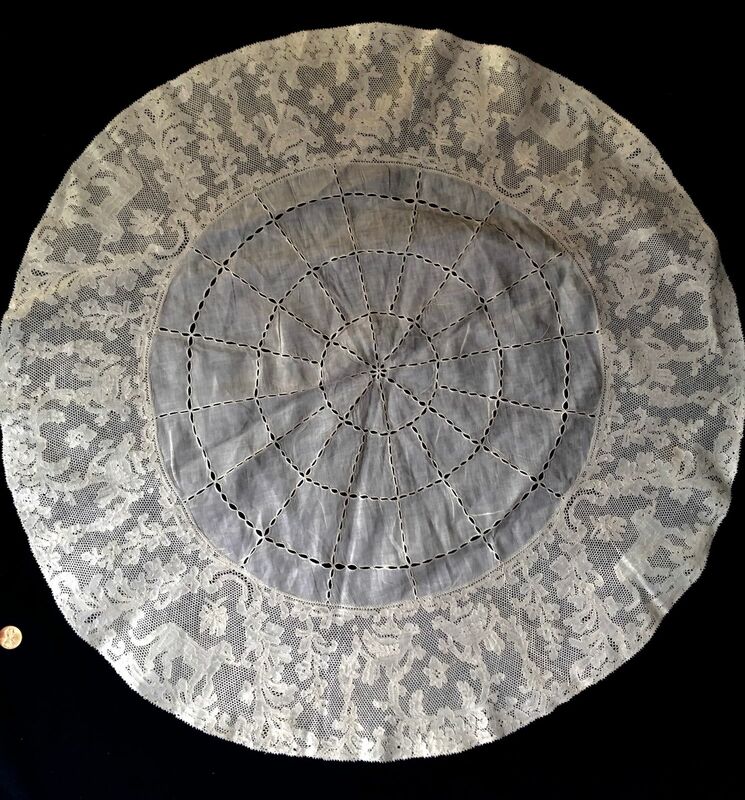 I don’t think the petals in the Point de Gaze inserts are raised, but there is raised work against halfstitch background in the bobbinlace. Both in leaves and the swag-work. This commonly seen in higher quality Duchesse. Most of the Point de Gaze are single roses, except at the ends where there are rows of decorative ‘mode’ fillings with regular PtdG ground. Unusual to see this quality Duchesse in table linens. Soilage: Seller cites a light cream color. Also says it has been hand laundered (no details) and lightly pressed. Auction ends: January 11, 2017 10:25 AM PST. 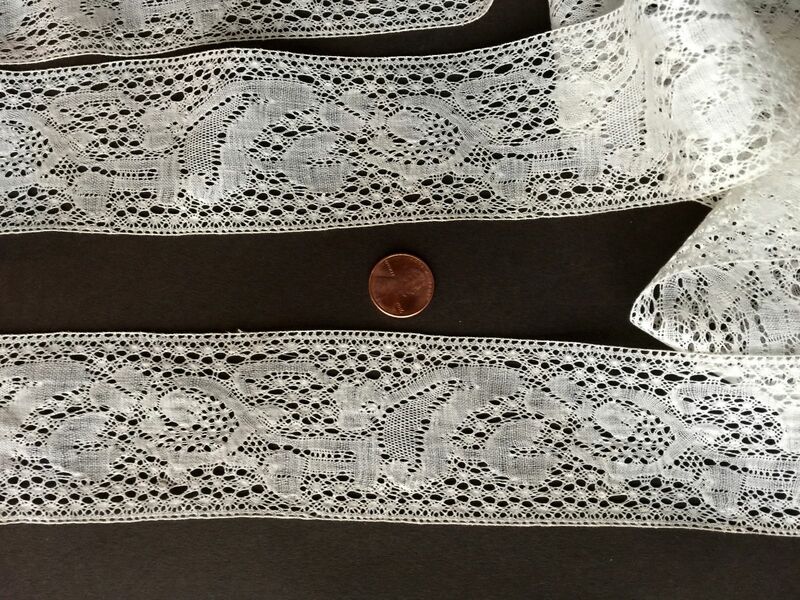 Comments: A large tablecloth of Cantu bobbinlace. It has two techniques – the typical scrolling vines with 3-headed flowers and hooks, along with inserts of what might be called Point de Milan. 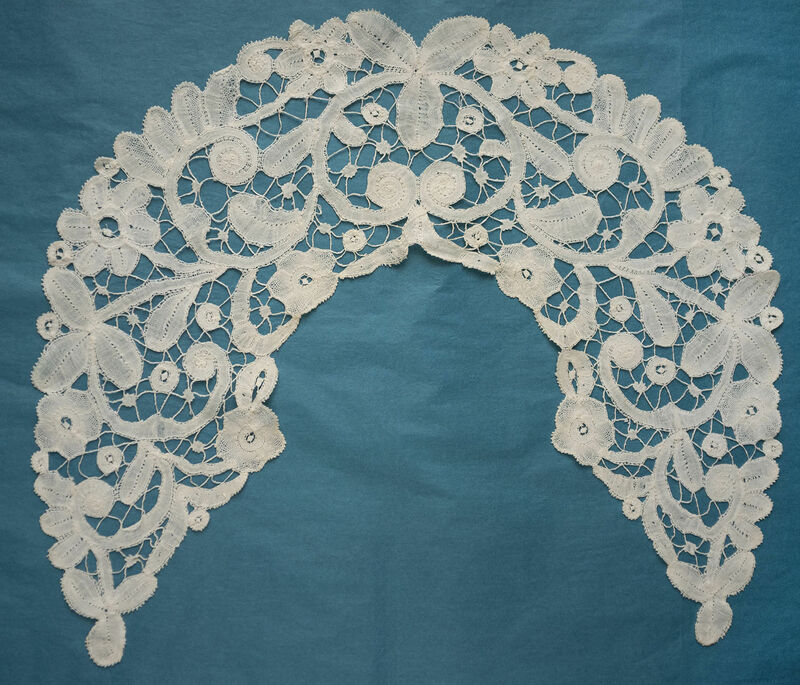 This is usually taken to mean pieced bobbinlace with a needle-made ground. The photos aren’t close enough to tell what kind of ground it has, it might be a bobbin plaited ground. 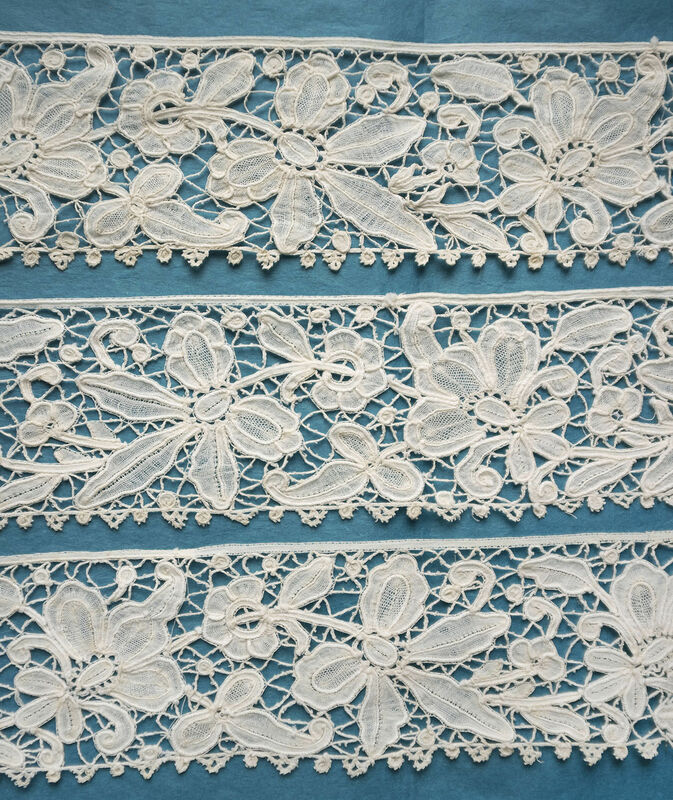 It is actually nice to see these two technique together, since it can often be difficult to attribute origin to this type of pieced lace. Auction ends: January 11, 2017 11:45 AM PST. 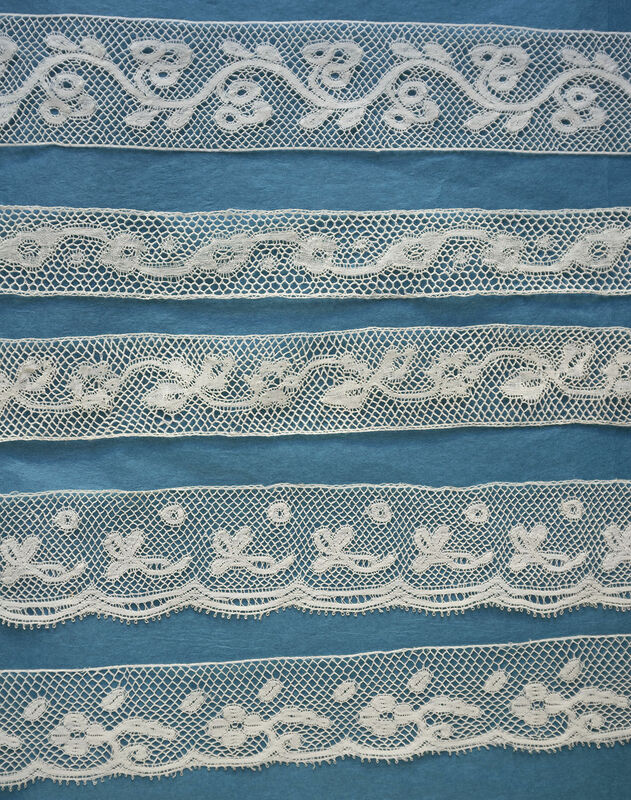 Comments: This type of lace with the rather stylized large motifs and variations on snow grounds and fillings is sometimes seen in the French Alps lacemaking regions, like Queyras. They are typically freehand laces. Sold for $185.30, 2 bidders. Auction ends: January 11, 2017 1:07 PM PST. 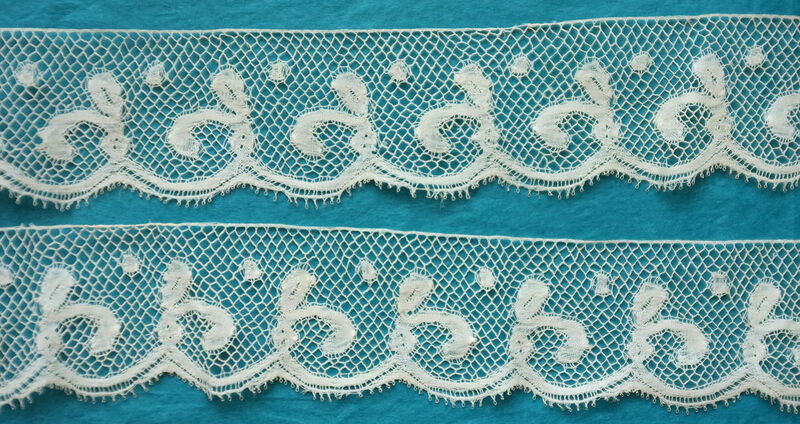 Comments: Matching cuffs of Brussels bobbinlace applique on machine net. Buttonholed rings are used as esprits. Only some tiny needle-made knot fillings, and no raised work. Interesting shape and pattern. Auction ends: January 11, 2017 1:18 PM PST. Provenance: Probably and Italian piece. 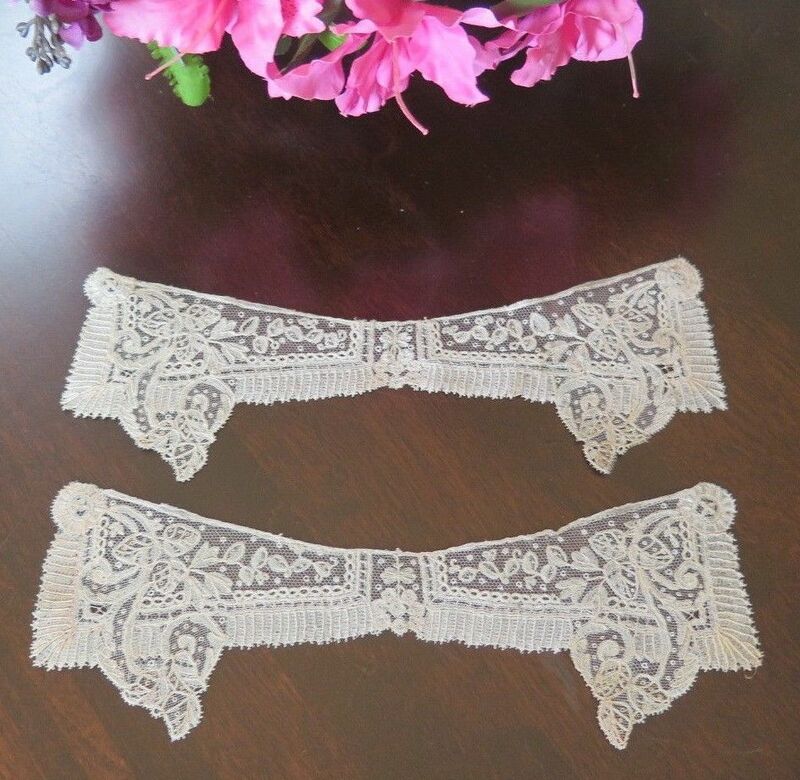 Tape lace border, and what really strikes me is the extended Venise-type plaited center. I can’t find any seams, wonder how they got such a large piece done. Wish there were closer photos. Finish: No obvious creases or wrinkles. Unused with original tag. Sold for $275.00, 1 bidder. Auction ends: January 11, 2017 1:56 PM PST. 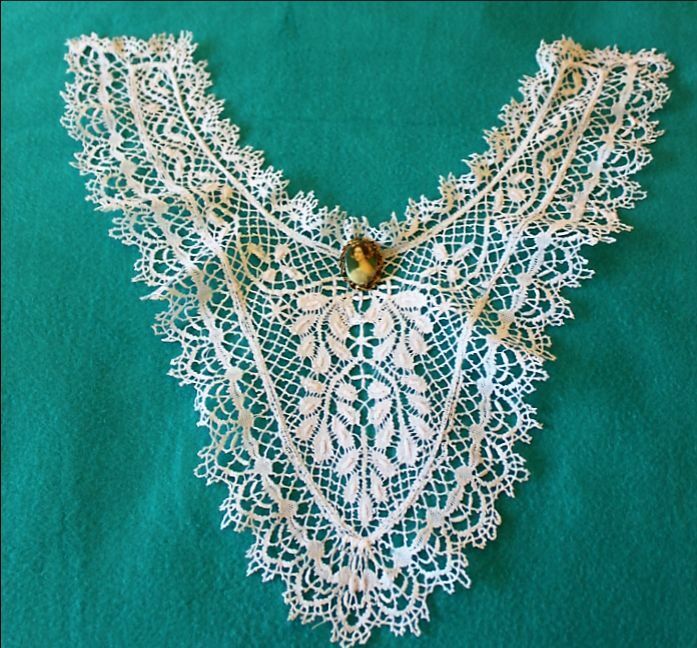 Comments: An Irish crochet collar. Irregular picoted brides. The non-traditional motifs have no raised work, but do have nicely finished edges. Some interesting filling stitches. 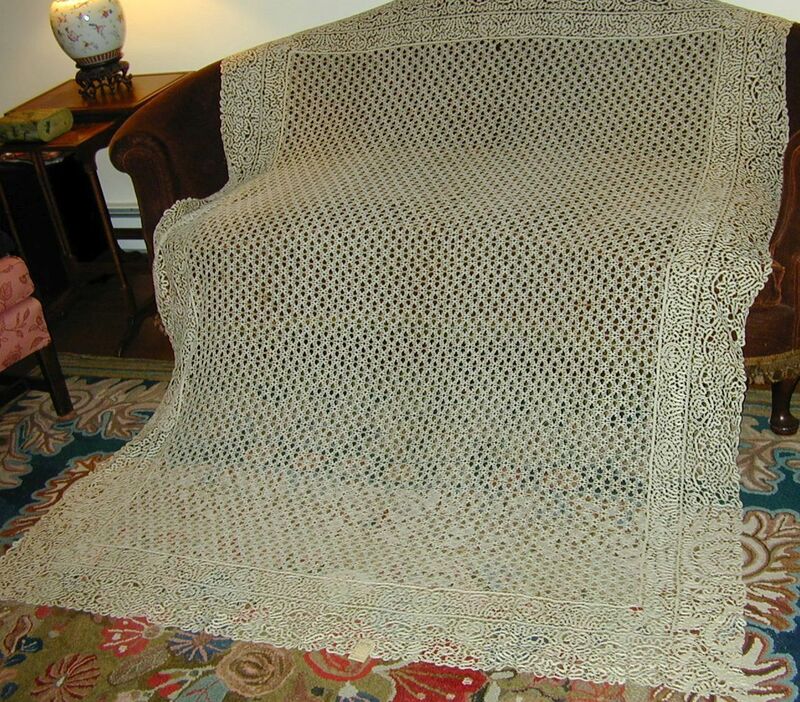 A lot of square edges in the design, and most clothwork is double crochet. I think the thread might be linen, it has that kind of shine. Damage: Broken upper right tip. Auction ends: January 12, 2017 10:13 AM PST. Comments: A border of Louis XV style Alençon. The floral design is a little plain, without the typical Louis XV undulations. Might be a little later in style. Good decorative ‘mode’ fillings along the border and in flower centers – these really make the piece. Provenance: From the collection of Margaret, Marchioness of Crewe, her daughter, the 9th Duchess of Roxburghe, and her great aunt, Lucy Cohen. Modifications: Cut both ends, secured on one end. Damage: Some pulls and tiny repairs to the mesh. Unusual to find mesh of this period in such good condition. Soilage: Seller cites mid ivory color. Sold for £123.00, 2 bidders. Auction ends: January 12, 2017 6:37 PM PST. 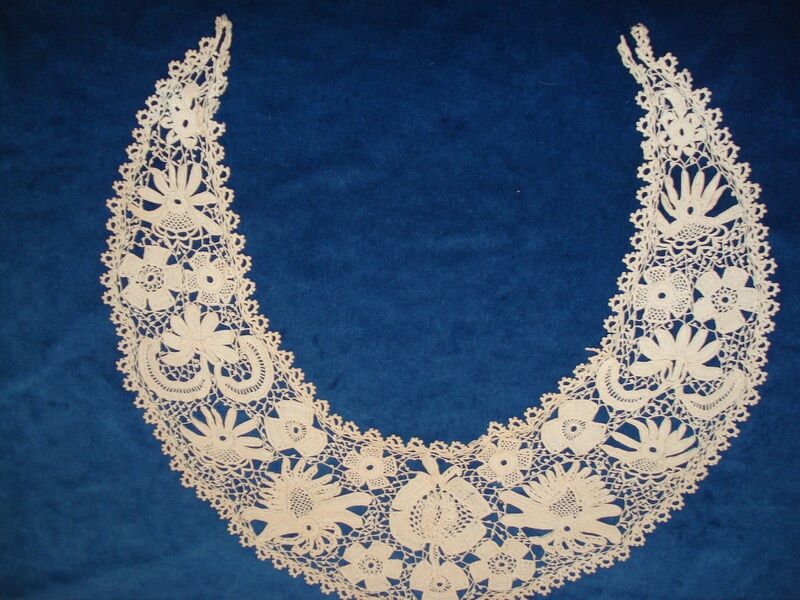 Comments: An Irish Crochet collar with a lighter Rose of Sharon pattern inside, and heavier guipure motifs on the outside. This can be a very effective combination. Good raised work in the motifs, and note the pinwheels of 3 shamrocks between the roses along the border. Soilage: Yellowing along the neckline. Auction ends: January 13, 2017 10:54 AM PST. 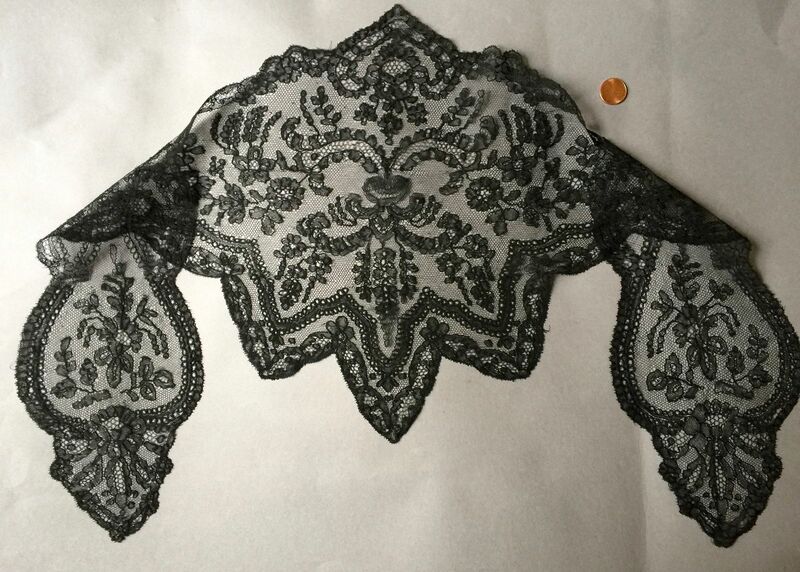 Comments: An interesting pieced lace with heavy gimp. It doesn’t have typical Bruges motifs, and I’m particularly struck by the motifs along the lower border. They resemble things found in Italian needlelaces. It is possible this is an Italian piece. Interesting design, good technique. Damage: A few loose threads. Auction ends: January 14, 2017 7:37 PM PST. 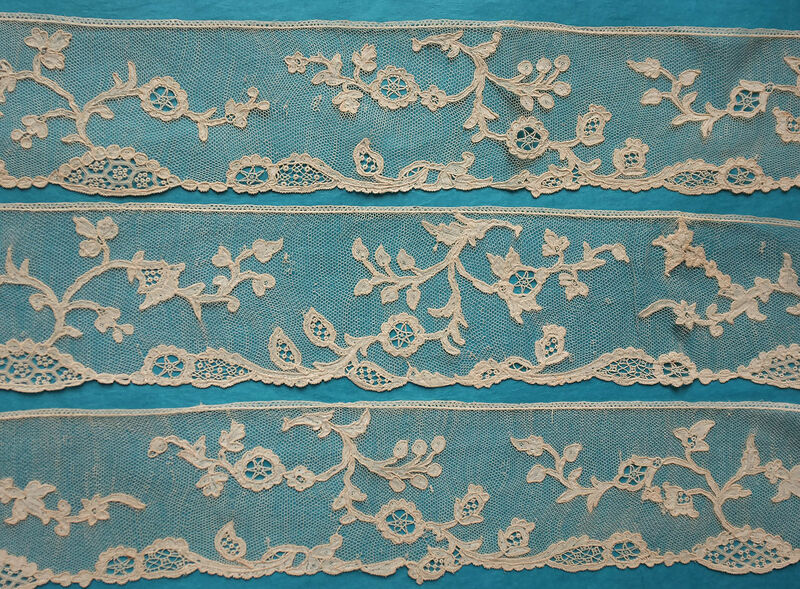 Comments: A pair of long Cantu lace runners with figural work. Most of the figures are embedded in the traditional cantu scrollwork. Birds have a bobbin-made ground inside ovals. These types of pieces don’t come up too often, but are a well recognized form. Soilage: Seller cites white color, one has a dark spot and smaller lighter spto.